Under Arctic Autumn conditions, you will have the opportunity to explore the rarely visited northern isles of Svalbard. Pack ice begins to open up, allowing for landings in some of the farthest reaches of the archipelago, including the outer islands of Nordaustlandet, Storoya and Kvitoya. Sailing past spectacular ice caps and dramatic calving glaciers, keep watch for walrus haul-outs, flocks of ivory gulls and polar bears hunting on the pack ice. Step ashore to explore the orange-coloured tundra and venture even deeper into the Arctic lands of Northern Svalbard. Enjoy a guided tour of Spitsbergen's colourful capital of Longyearbyen. Embark Polar Pioneer late in the afternoon, and enjoy a warm welcome from our expert expedition team. After settling into your cabin, we will depart Longyearbyen in the early evening. Awaken in the Nordvest-Spitsbergen National Park - the rugged north-west corner of Svalbard's largest island, Spitsbergen. Alpine peaks and glacier valleys dominate the landscape which is home to reindeer, walrus and Arctic fox. We'll cruise past spectacular sea-cliffs, watching as the last of the season's seabirds take flight, and explore the region's calving glaciers such as Smeerenburg on Amsterdam Island and discover the remains of ancient whaling stations at Ytre Norskøya. Our captain steers Polar Pioneer northeast to reach the coast of Svalbard's second largest island, Nordaustlandet - a polar desert rich in geological wonders. We'll traverse the northern coastline, landing ashore for tundra walks amongst the autumn-hues in search of wildlife like reindeer and walruses. 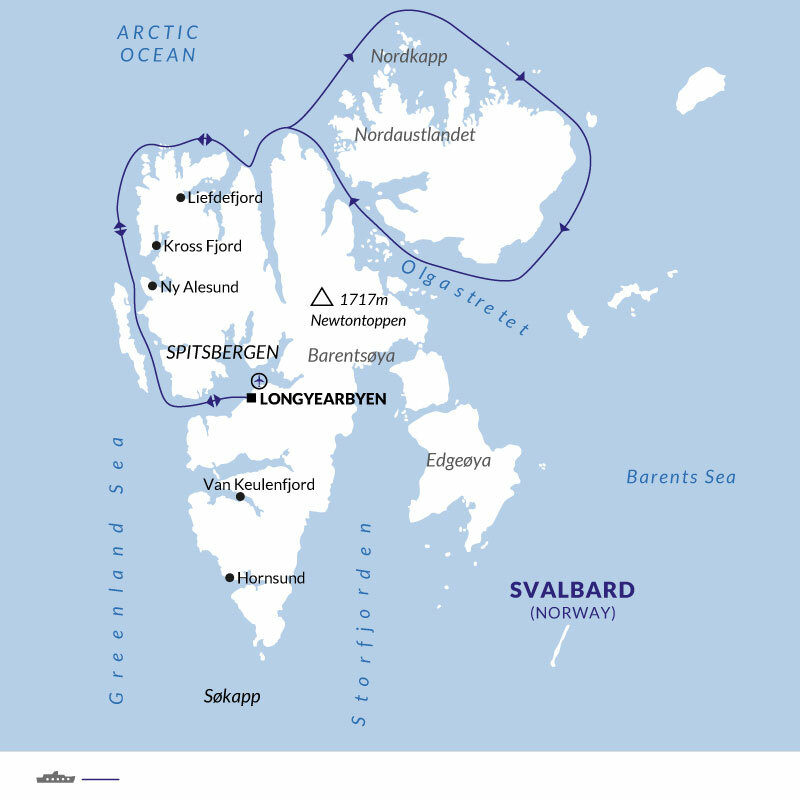 If weather and ice permits, we hope to attempt landings or cruises at Sjuøyane, known as the Seven Isles and the most northerly point of the Svalbard archipelago - and Norway. It is also home to a large colony of walruses and frequented by roaming polar bears. We also hope to explore the magnificent 40 kilometre fjord at Rijpfjord. Over the next two days weather and ice will dictate our journey as we head further north into the thickening pack ice in search for polar bears and walrus as they hunt and haul-out on the ice and keep watch for the elusive and elegant ivory gull. We continue across the top of Nordauslandet towards Svalbard's most easterly islands, Kvitøya and Storøya and aim to take a spectacular Zodiac cruise around Karl XII Island - Norway's second-most northern point on the route. Completing our circumnavigation of Nordaustlandet, we'll head north through the Hinlopen Strait. Along the way we may take a Zodiac cruise around Austfonna, an impressively large ice cap with one of the longest glacier fronts in the northern hemisphere. We'll also Zodiac cruise under the impressive sheer cliffs of Alkfjellet, the summer nesting ground of thousands of birdlife as well as explore Isisøya by Zodiac, and make a landing at Murchisonfjorden, both of which are steeped in rich history and amazing scenery. Returning along the stunning north-western Spitsbergen coast, we keep an eye on ice and weather conditions and make as many landings as possible. Possible landing spots in Spitsbergen's North west coastline include Woodfjord, Liefdefjord, Krossfjord and Kongsfjord.